The cytokines IL-6, IL-11, LIF,3 CNTF, OSM, and CT-1 are grouped into the IL-6 family of cytokines (1). The biologic action of these cytokines is mediated by multisubunit, cell surface receptors that share a common signaling subunit, the gp130 signal transducing molecule (1, 2). The subunits of these receptors are members of the cytokine/growth hormone receptor family that have conserved cysteine and tryptophan residues in the extracellular domain and that signal via the JAK/STAT pathway (1, 3, 4, 5). IL-6 and IL-11 use a gp130 homodimer, and OSM, CNTF, LIF, and CT-1 use a heterodimer of gp130 and the 190-kDa LIF receptor for the activation of intracellular signaling cascades (1, 6). A very early event is tyrosine phosphorylation of the 92-kDa STAT3 protein by JAK1 or JAK2 kinase (7, 8). The receptor signaling complexes for CNTF, IL-6, IL-11, and probably CT-1 (1, 9) contain an additional ligand-specific subunit that is not required for LIF and OSM binding. Recently, an additional OSM-specific receptor has been identified that forms a heterodimer with gp130 (10). The specific ligand binding receptor proteins have been identified in membrane-bound and soluble (s) forms. In contrast to other soluble receptors, such as sTNF-R, sIL-1R, and sIL-4R, that antagonize the actions of their ligands, the soluble receptors for the cytokines of the IL-6 family act agonistically upon binding, i.e., they stimulate gp130-expressing cells that on their own would not be able to respond to the cytokines (11). Cells responsive to the combination of IL-6 and sIL-6R but not to IL-6 alone include hemopoietic progenitor cells, endothelial cells, and neuronal cells (12, 13, 14, 15). The number of gp130 molecules on hepatocytes seems to exceed the number of IL-6R molecules, since the presence of the sIL-6R leads to a dramatic sensitization toward IL-6 (16). The physiologic importance of activation of the gp130 receptor subunit on various cells has recently been demonstrated in vitro and in vivo for hemopoietic progenitor cells (15, 17) and in the process of liver regeneration (18). We have recently designed a fusion protein consisting of human IL-6 and the human sIL-6R connected by a flexible peptide chain and have demonstrated that this protein, termed Hyper-IL-6, is highly active on gp130-expressing cells in vitro (17). To test the function of this protein in vivo, we injected Hyper-IL-6 into mice and compared the resulting acute phase response induction with the respective effects of IL-6 alone. We demonstrate in this report that the yeast-derived designer cytokine is fully active in vivo, has a 100-fold increased biologic activity compared with IL-6, and acts markedly longer than IL-6. Using iodinated proteins, we show that impaired internalization of Hyper-IL-6 might account for these effects. Human haptoglobin cDNA was a gift from Dr. D. Samols (Cleveland, OH). Recombinant human (rh) IL-6 was prepared as described (19). Hyper-IL-6 was prepared as recently described (17). The human IL-6 ELISA kit was obtained from CLB (Amsterdam, The Netherlands) and was used to measure human IL-6 and Hyper-IL-6 in murine serum. Values obtained for Hyper-IL-6 were multiplied by 3, since the molecular mass of Hyper-IL-6 (∼60 kDa) was threefold higher than that of IL-6 (∼20 kDa). Human hepatoma cells (HepG2) were grown in DMEM at 5% CO2 in a water-saturated atmosphere. All cell culture media were supplemented with 10% FCS, 100 mg/l streptomycin, and 60 mg/l penicillin. Mice were maintained in a 12-h light, 12-h dark cycle under standard conditions and were provided food and water ad libitum. Procedures involving animals and their care were conducted in conformity with national and international laws and policies. The rhIL-6 and Hyper-IL-6 were injected i.p. at the doses indicated in the figures. Mice were killed by cervical dislocation, and total RNA was isolated from the liver by the phenol/chloroform method (20). From cells, total RNA was prepared using the RN-Easy preparation kit (Qiagen, Chatsworth, CA). Five micrograms of heat-denatured RNA per sample was fractionated on a 1% agarose gel with 7% formaldehyde. The separated RNA was transferred to GeneScreen Plus membranes (DuPont-New England Nuclear, Dreieich, Germany) according to the manufacturer’s instructions. The filters were prehybridized at 68°C for 2 h in 10% dextran sulfate, 1 M NaCl, and 1% SDS and hybridized in the same solution with [32P]cDNA fragments labeled by random priming (21). A 0.9-kb HinfI restriction fragment of human haptoglobin cDNA and a 1.3-kb EcoRI/HinfI fragment of glyceraldehyde-3-phosphate dehydrogenase (GAPDH) were used as probes. The hybridized filters were washed under stringent conditions and exposed to x-ray films (XAR-5, Eastman Kodak, Rochester, NY). Stimulation of HepG2 cells was measured as the secretion of the acute phase protein haptoglobin analyzed by ELISA, as recently described (22). The rhIL-6 and yeast expressed Hyper-IL-6 were iodinated according to the procedure of Markwell (23) with modifications as previously described (24). HepG2 cells were grown to confluence using 24-multiwell plates (Nunc, Dreieich, Germany). After confluence was reached (∼5 × 105 cells/well), cells were washed twice with ice-cold binding medium (DMEM containing 0.2% (w/v) BSA). Binding was initiated by the addition of [125I]rhIL-6 or [125I]Hyper-IL-6 at a concentration of 100 pM for 4 h at 4°C in the presence of increasing amounts of unlabeled rhIL-6 or Hyper-IL-6, respectively (0.1–1000 nM). After 4 h, medium was removed, and the cells were washed three times with PBS containing 1 mM MgCl2, 0.1 mM CaCl2, and 0.2% BSA. Cells were subsequently lysed in 1 ml of 1 M NaOH, and radioactivity was measured in a gamma counter. Binding affinities were calculated by nonlinear regression using the computer program PrismGraph (GraphPad, San Diego, CA). All experiments performed in duplicate were repeated three times. In a total volume of 1 ml of ice-cold binding medium, HepG2 cells that had been grown to confluence in 35-mm dishes were preloaded with 1 nM [125I]rhIL-6 or [125I]Hyper-IL-6 at 4°C for 2 h. Internalization was initiated by warming the cells to 37°C. Surface-bound [125I]rhIL-6 or [125I]Hyper-IL-6 was determined after different periods of incubation after subjecting the cells to 0.5 M NaCl/HCl, pH 1, for 3 min followed by an additional wash with PBS containing 0.2% BSA. Internalization of [125I]rhIL-6 or [125I]Hyper-IL-6 was determined after lysis of the cells in 1 ml of 1 M NaOH. All experiments performed in duplicate were repeated three times. One major activity of IL-6 is the induction of the hepatic acute phase response (25). We therefore analyzed the induction of the acute phase response gene expression in the livers of NMRI mice injected i.p. with IL-6 or Hyper-IL-6. In time-course experiments the mice were injected with either 40 μg of IL-6 or 4 μg of Hyper-IL-6 per mouse. Following i.p. injection, mice were killed by cervical dislocation at the different time points as indicated in the figures. RNA was prepared from the livers and subjected to Northern blot analysis. As can be seen in Figure 1⇓A, when 40 μg of IL-6 was injected into NMRI mice, the peak haptoglobin mRNA expression was detected 4 to 6 h after injection, declined after 8 h, and returned to the baseline after 24 h. Upon injection of only 1/10th (4 μg) of the designer protein Hyper-IL-6 (Fig. 1⇓B), however, haptoglobin mRNA expression increased for 12 h and peaked 12 to 24 h after injection. Most importantly, 48 h after injection, there was still considerable haptoglobin mRNA expression, and only at 72 h after injection did the mRNA return to baseline values. Of note, haptoglobin mRNA expression in animals receiving Hyper-IL-6 was much stronger than that in mice receiving IL-6. These experiments demonstrate that the designer protein tested in this study is active markedly longer, especially considering the fact that Hyper-IL-6 was injected at a 10-fold lower dosage than IL-6. As shown in Figure 2⇓, the two proteins were injected at increasing concentrations into NMRI mice. Mice were sacrificed after 4 h, and RNA was prepared from the livers and subjected to Northern blot analysis. The first appreciable induction of the haptoglobin mRNA by IL-6 was detected at a dose of 0.4 μg/mouse (Fig. 2⇓A). By contrast, Hyper-IL-6 induced a comparable haptoglobin mRNA induction at a dose of 0.004 μg/mouse (Fig. 2⇓B). The level reached after injection of 0.4 μg/mouse Hyper-IL-6 was comparable to the induction reached with 40 μg/mouse of IL-6. No change in mRNA content occurred for the constitutively expressed GAPDH gene. 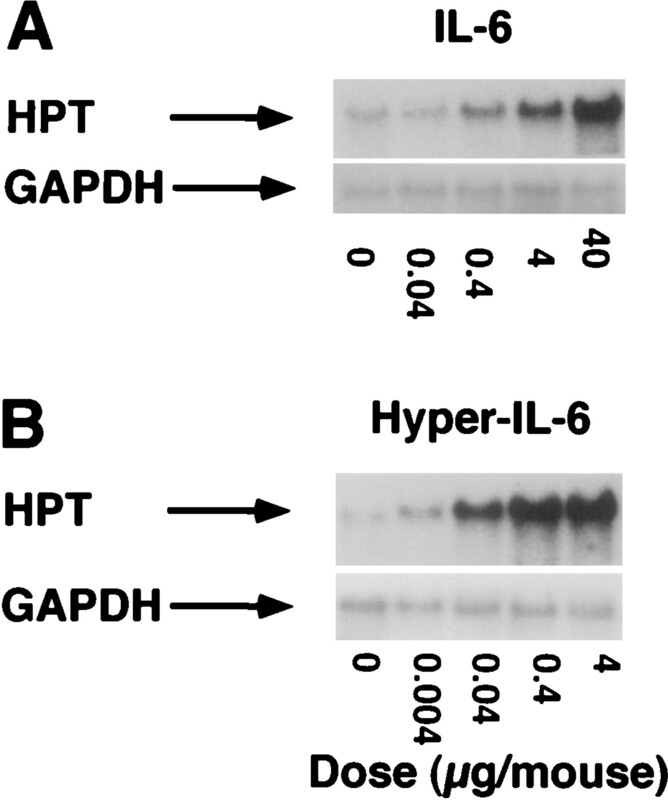 Therefore, in mice, Hyper-IL-6 showed a 100-fold higher activity of induction of the acute phase protein haptoglobin than did IL-6. To investigate the fate of injected IL-6 or Hyper-IL-6 in vivo, we determined human IL-6 and Hyper-IL-6 serum levels using a human IL-6 ELISA. Figure 3⇓A demonstrates the corresponding serum levels of the mice analyzed in Figure 1⇑, A and B. In mice injected with 40 μg of IL-6, IL-6 serum levels peaked at 2 h following injection and were detectable only 8 h following injection. Upon injection of 4 μg of Hyper-IL-6, however, Hyper-IL-6 serum levels peaked 1 to 3 h following injection and were detectable as long as 48 h. This experiment showed that the designer protein Hyper-IL-6 circulated for a significant longer time in the serum in vivo. In Figure 3⇓, B and C, the corresponding serum levels of the mice analyzed in Figure 2⇑ are presented. While the injection of 0.4 μg of IL-6 did not result in the detection of IL-6 in the serum 4 h after application (Fig. 3⇓B), the same dose of Hyper-IL-6 yielded a significant amount of Hyper-IL-6 circulating in the serum after the same period of time (Fig. 3⇓C). When the doses of 4 μg of IL-6 and 4 μg of Hyper-IL-6 were compared, the latter caused serum levels of 45 ng/ml compared with 1.5 ng/ml for IL-6. These data demonstrate that injection of Hyper-IL-6 led to 30-fold higher serum concentrations in the circulation compared with IL-6. Plasma levels of IL-6 and Hyper-IL-6. 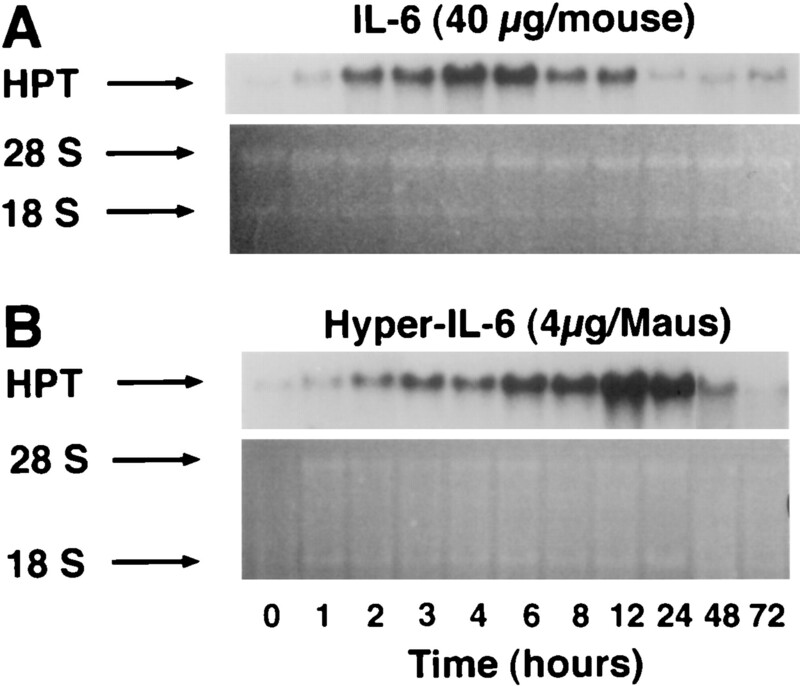 A, Time-course study of IL-6 and Hyper-IL-6 plasma levels measured with a human IL-6 ELISA in NMRI mice injected with 40 μg of IL-6/mouse (white bars) or with 4 μg of Hyper-IL-6/mouse (black bars) at the time points indicated. B and C, Dose-response study of IL-6 and Hyper-IL-6 serum levels measured with a human IL-6 ELISA in NMRI mice injected with various dosages of IL-6 (B) and Hyper-IL-6 (C). Mice were sacrificed 4 h after injection. The mice represented in the figure are the same animals as those described in Figures 1⇑ and 2⇑. 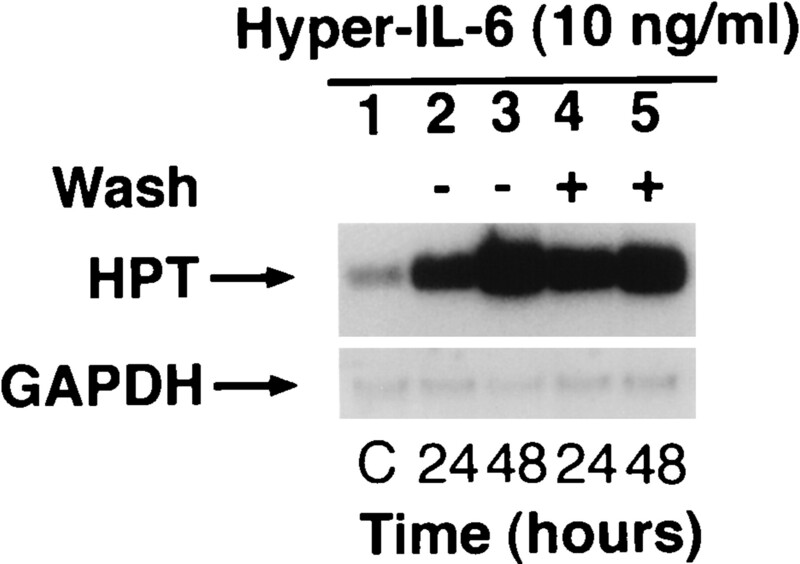 The observed longer activity of Hyper-IL-6 in vivo could be due to the increased plasma half-life of the fusion protein compared with that of IL-6. If this would be the case, the extended time course of activity of Hyper-IL-6 should not be observed in cell culture experiments in vitro. HepG2 cells were stimulated in a time-course experiment with 10 ng/ml of IL-6 and Hyper-IL-6. In cells stimulated with IL-6, the peak induction of haptoglobin mRNA was found at 24 h after stimulation and declined thereafter (Fig. 4⇓A). When Hyper-IL-6 was used, haptoglobin mRNA expression peaked at 48 h following stimulation and lasted longer than 72 h (Fig. 4⇓B). No change in mRNA content occurred for the constitutively expressed GAPDH gene. 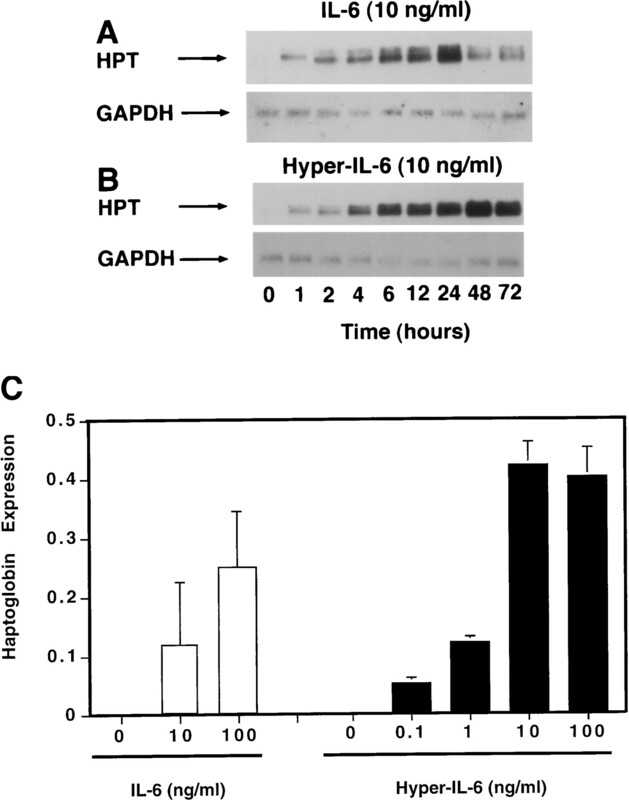 When different concentrations of IL-6 and Hyper-IL-6 were tested on HepG2 cells, and haptoglobin secretion was measured by ELISA, Hyper-IL-6 at 1 ng/ml induced haptoglobin levels reached after 10 ng/ml of IL-6 stimulation (Fig. 4⇓C). Stimulation with 10 and 100 ng/ml Hyper-IL-6 led to higher haptoglobin levels, exceeding those obtained after stimulation with 100 ng/ml. Since IL-6 and Hyper-IL-6 are stable for days in medium containing 10% FCS (data not shown), we speculated that the extended time course of Hyper-IL-6 could be caused by decreased cellular uptake or increased binding affinity of the fusion protein Hyper-IL-6. We investigated whether the Hyper-IL-6-induced biologic activity could be abolished by washing the cells with cytokine-free medium 24 h after stimulation (Fig. 5⇓). Five 10-cm cell culture dishes were cultured with HepG2 cells to 60% confluence and were incubated for 24 h with Hyper-IL-6 (10 ng/ml). After 24 h RNA was prepared from one dish to document the haptoglobin mRNA concentration (Fig. 5⇓, lane 1). At the same time point, two of the remaining dishes were washed three times with PBS at 37°C, and the medium was replaced with cytokine-free medium. The two other dishes were left unwashed, and incubation was continued in the presence of Hyper-IL-6. At 24 and 48 h, respectively, RNA was prepared from washed (lanes 4 and 5) and unwashed (lanes 2 and 3) cells. It can be seen in Figure 5⇓ that washing of HepG2 cells had no significant influence on haptoglobin mRNA expression 48 and 72 h poststimulation. No change in mRNA content occurred for the constitutively expressed GAPDH gene. For binding and internalization measurements of IL-6 and Hyper-IL-6, iodinated cytokines were needed. IL-6 and Hyper-IL-6 were iodinated using 125I-labeled Bolton-Hunter reagent. To demonstrate that radiolabeled and unlabeled IL-6 and Hyper-IL-6 had equal biologic activities, murine B9 cells (26) and BAF/3 cells stably transfected with the human gp130 cDNA (27) were used. Murine B9 cells were stimulated with different concentrations of [125I]IL-6 and unlabeled IL-6 (Fig. 6⇓A). BAF/3-gp130 cells were stimulated with different concentrations of [125I]Hyper-IL-6 and unlabeled Hyper-IL-6 (Fig. 6⇓B). Proliferation was measured after 72 h using the 3-[4,5-dimethylthiazol-2-yl]2,5-diphenyltetrazolium bromide proliferation assay. It can be seen in Figure 6⇓ that no difference with respect to biologic activity of radiolabeled or unlabeled IL-6 and Hyper-IL-6 could be demonstrated on BAF/3-gp130 cells or on murine B9 cells. To investigate the stability of the designer protein, radiolabeled [125I]Hyper-IL-6 (10,000 cpm/well) was used on HepG2 cells in a 96-well plate in DMEM containing 10% FCS at 37°C (Fig. 6⇑C). After the time points indicated in Figure 6⇑, supernatant was harvested from the HepG2 cells. It is evident that the fusion protein is not degraded in vitro in the presence of FCS. 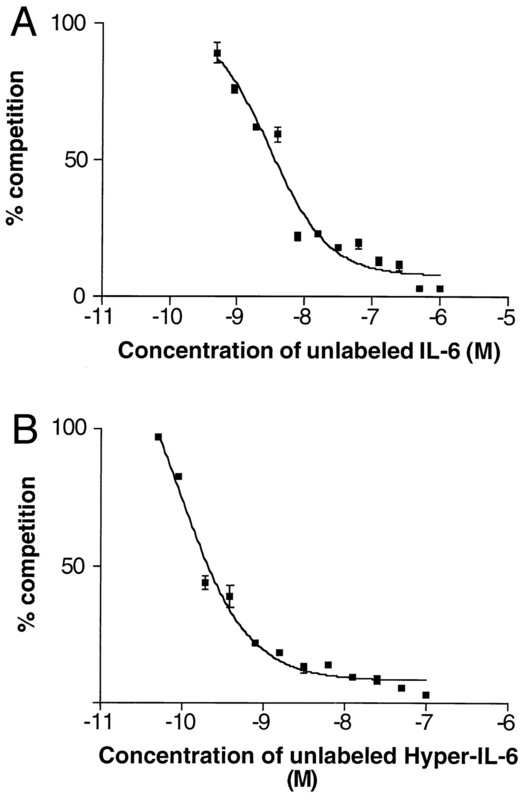 It can be concluded from these data that proteases present in serum are not capable of cleaving the flexible polypeptide linker that was used to connect one molecule of IL-6 with one molecule of sIL-6R. A plausible explanation for the fact that Hyper-IL-6 could not be washed away, as demonstrated in Figure 5⇑, was that binding of Hyper-IL-6 to the gp130 signal transducing molecule was tight and could not be reversed by washing the cells with medium. Using [125I]IL-6 and [125I]Hyper-IL-6, we performed competitive binding studies to measure the affinities of the cytokines for their respective receptors. Binding curves are shown in Figure 7⇓, A and B. From these curves, a Kd value for IL-6 of 3.09 × 10−9 M was calculated, which is reasonably close to the low affinity binding of IL-6 to the membrane-bound IL-6R (28). For Hyper-IL-6, a Kd value of 5.936 × 10−11 M was calculated, in line with the high affinity binding for the IL-6/sIL-6R complex, which has been reported to range from 1.5 × 10−11 on HepG2 cells (29). To learn more about the fate of IL-6 and Hyper-IL-6 upon interaction with their respective receptors on the cell surface, we performed internalization studies on HepG2 cells using [125I]IL-6 and [125I]Hyper-IL-6. As shown in Figure 8⇓A, [125I]IL-6 was rapidly internalized (diamonds). Concomitantly, surface-bound IL-6 molecules were lost (squares). 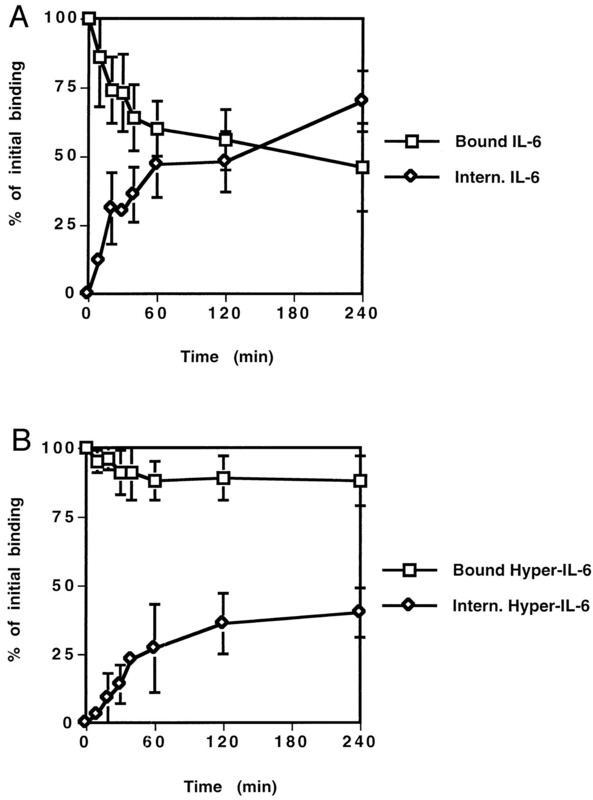 By contrast, when [125I]Hyper-IL-6 was used in the binding studies, internalization was impaired (Fig. 8⇓B). Within 60 min only 10% of the surface-bound Hyper-IL-6 was internalized compared with 45% when IL-6 was used. These results strongly indicate that internalization of the designer cytokine Hyper-IL-6 was impaired and that this impairment might contribute to the prolonged and increased bioactivity of Hyper-IL-6. In this study we have examined the biologic activities in vitro and in vivo of a designer cytokine expressed in the yeast Pichia pastoris consisting of a cytokine fused covalently to its soluble receptor. We have compared the function of this designer cytokine, termed Hyper-IL-6, with that of IL-6 alone. Hyper-IL-6 displayed significantly longer activity in vivo and had a longer plasma half-life compared with IL-6 alone. Hyper-IL-6 is 10- to 100-fold more active than the IL-6 counterpart. When transferred to an in vitro system, we demonstrate that, again, Hyper-IL-6 was more active, and its effects lasted considerably longer compared with IL-6 alone. Several important considerations arise from the above-described findings. We have previously shown in a transgenic mouse model that the sIL-6R functions as a carrier protein for its ligand IL-6 and causes a stable IL-6/sIL-6R complex, resulting in a markedly prolonged plasma half-life of IL-6 (16). The observed reduction of plasma clearance of IL-6 in the presence of sIL-6R was explained by the size of the IL-6/sIL-6R complex, which was expected to be cleared by the kidney less efficiently than IL-6 alone (16). Furthermore, we have demonstrated that the presence of the sIL-6R in vivo led to a considerable sensitization of the IL-6 response (16). A similar mechanism might contribute to the findings observed in this study when a designer cytokine has been constructed, where IL-6 was fused covalently to its soluble receptor. We have demonstrated in this study on HepG2 cells, a higher binding affinity and an impaired internalization of Hyper-IL-6 compared with IL-6. HepG2 cells express 450 high affinity sites and 2000–5000 low affinity sites for IL-6. Low affinity sites are sites where IL-6 is bound to the IL-6R (Kd ∼ 10−9 M), whereas high affinity sites are sites where the complex of IL-6 and the IL-6R is bound to the gp130 signal (Kd ∼ 10−11 M) (28, 29). IL-6 has virtually no binding affinity to the gp130 signal transducer itself (30, 31). From studies performed previously in our laboratory, it became evident that on hepatoma cells, gp130 expression exceeds by far expression of the specific IL-6R (29, 32). The ratio of gp130 molecules to IL-6R molecules expressed on various types of hepatoma cells is around 6:1 as measured by FACS analysis (H. K. Bos and J. Brakenhoff, unpublished observations). Hyper-IL-6, being the covalently linked IL-6/sIL-6R complex, should bind directly to the gp130 signal transducer. This explains why Hyper-IL-6 can stimulate more gp130 molecules on the cell surface of hepatocytes than IL-6 alone. Analyzing hepatic haptoglobin expression in transgenic mice expressing high amounts of the sIL-6R demonstrated that these animals were significantly sensitized toward exogenously administered human IL-6. These results also strongly support the idea of a higher gp130 than IL-6R expression rate on hepatocytes (16). In summary, these findings are the basis of the understanding that cells expressing far more gp130 than IL-6R are particularly sensitive to activation by the IL-6/sIL-6R complex. Hepatocytes and hepatoma cells, as demonstrated in the studies discussed above, are examples of such cells. Cells expressing gp130 on their surface are capable to remove the IL-6/sIL-6R complex from the circulation by endocytosis (33). It has been shown that 125I-labeled sIL-6R and IL-6 were internalized and rapidly degraded within lysosomes by HepG2 cells that express gp130 molecules (33). We speculate that the differences in binding affinity and internalization properties between IL-6 and Hyper-IL-6 are not only caused by the ratio of IL-6R and gp130 signal transducers expressed on the liver cell. Since IL-6 and sIL-6R were rapidly internalized molecules (33), the results presented in this study in Figures 4⇑C and 6 support the hypothesis that steric hindrance of the polypeptide linker that connects IL-6 with the sIL-6R could interfere with the internalization process, leading to decreased internalization of the molecule on target cells, which, in turn, would lead to an increased plasma half-life in vivo. Interestingly, a recent study has investigated whether gp130 internalization and signaling are functionally linked processes (34). The authors provide evidence that gp130 internalization and signaling can clearly be dissected. They constructed one set of mutants of gp130 that can internalize and not signal. A second set of mutants can signal but not internalize. Mutants that lack regions important for signaling and internalization have lost the ability for both signaling and internalization (34). One has to consider the fact that the Hyper-IL-6 molecule has been produced in the yeast P. pastoris. To date, most yeast-derived proteins tested in biotechnology have been derived from Saccharomyces cerevisiae. These proteins show generally a high mannose glycosylation resulting in the rapid clearance via mannose receptors in vivo (35). By contrast, the glycosylation of P. pastoris-derived proteins, which have been used in the present study, is more similar to that of proteins expressed in mammalian cells (36) and therefore is more suited for in vivo application. Accordingly, it has recently been demonstrated that immunization of mice with recombinant influenza neuraminidase that had been expressed in P. pastoris protected the animals against a lethal influenza challenge (37). It remains to be demonstrated, however, whether Hyper-IL-6 produced in mammalian systems show even longer plasma half-lives in vivo compared with P. pastoris-derived Hyper-IL-6. We are currently exploring this possibility in our laboratory. In summary we used a designer cytokine consisting of IL-6 covalently linked to its soluble receptor. Several important points arise from the presented data. The particular importance of this molecule lies in its capacity to stimulate cells that express only gp130 on their surface but not the specific IL-6R and in the applicability of this protein in vivo. The possible therapeutic use of unlinked IL-6 and sIL-6R is hampered by the high concentrations of the sIL-6R protein required (12, 17). Therefore, the described Hyper-IL-6 might be especially useful for future in vivo applications. The physiologic importance of the activation of the gp130 receptor subunit on various cells has recently been demonstrated in vitro and in vivo for hemopoietic progenitor cells (15, 17), for endothelial cells (13), and in the process of liver regeneration (18). Using Hyper-IL-6, it will be possible to induce longer stimulation and activation of gp130-expressing cells in vivo in clinical situations. Apart from possible clinical applications, Hyper-IL-6 will become an important tool to learn more about cells expressing only gp130 signal transducers and cell that express low levels of IL-6R. We thank Sabine Werfel, M.D., for critically reading the manuscript. C. Trautwein, M.D., is thanked for fruitful discussions. We thank B. Gilberg for excellent technical assistance and B. Sayah for excellent help with the artwork. 1 This work was supported by the Deutsche Forschungs-Gemeinschaft (Bonn, Germany), the Naturwissenschaftlidr-Medizinisches Forschungszentrum (Mainz, Germany), and the Stiftung Rheinland Pfalz für Innovation (to M. P. and S.R.-J.). 3 Abbreviations used in this paper: LIF, leukemia inhibitory factor; CNTF, ciliary neurotropic factor; OSM, oncostatin M; CT-1, cardiotropin-1; s, soluble; rh, recombinant human; GAPDH, glyceraldehyde-3-phosphate dehydrogenase.